I hope everyone has a great day today. Here are some ornaments from our Christmas tree. As is true for most fortysomething broads like me, I have collected ornaments over the years, and I now have more “special” ornaments than those that have come out of a box. 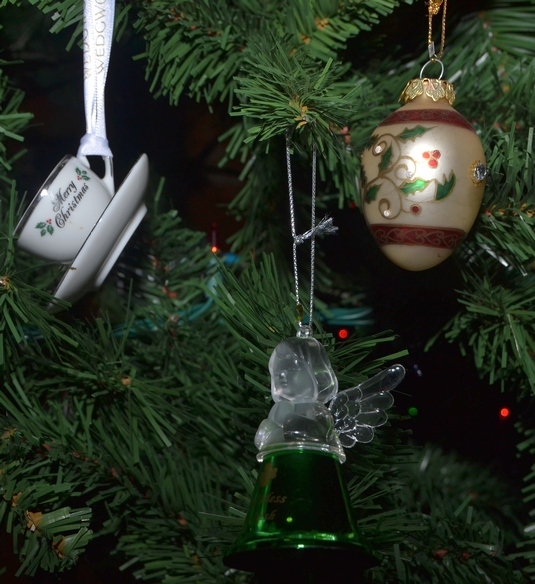 Here, we have an angel bell with “God Bless the Irish” and a shamrock (didn’t you know those were Christmasy?) and a Wedgewood teacup and saucer, and one of my box ornaments. Sorry it’s a little dark. I hope this post brought you a little cheer. If you’re feeling glum (I sure was), remember that a great way to get a little cheer is to spread a little cheer. It comes back! Just like a good deed. New Feature – Did You Read It? Merry Christmas, Tia! I wish all the best for the coming New Year.